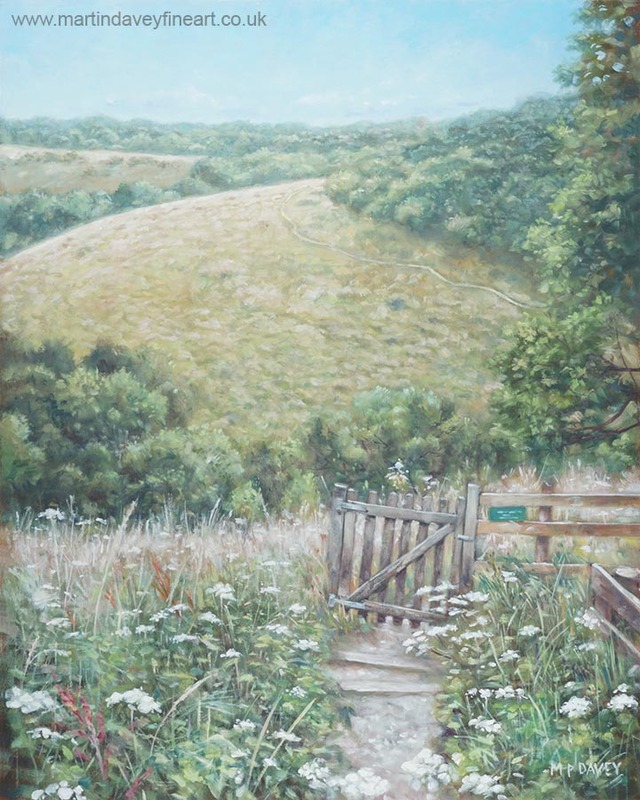 This painting shows a view in the area of Old Winchester Hill, in the county of Hampshire, UK, during a summers day. The area shown is connected to Winchester Hill (not shown) which was an Iron Age fort built between 600 – 300BC on the chalk hill, most of which has not been excavated. The picture shows a gate leading to a fenced off area. It was used as a mortar testing range in WW2 and contains unexploded devices, although sheep are allowed to graze there. Currently the site is part of the South Downs National Park, and is not near the city of Winchester, but 11 miles away. The painting is sized at 20” x 16”, and painted in oils on a mounting board support. It was completed during autumn 2018.